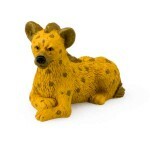 Hyenas hunt and live in large packs and are efficient hunters and scavengers. They have few natural predators as lions are the only animals that can outrun them. Hyenas can weigh anywhere from 90 pounds to almost 200 pounds! Origin: Africa and eastwards through Arabia to India. Diet: wildebeest or antelope. They also eat birds, lizards, snakes, and insects. Print the Spotted Hyena Character Card! Spotted hyenas are famed scavengers and often dine on the leftovers of other predators. 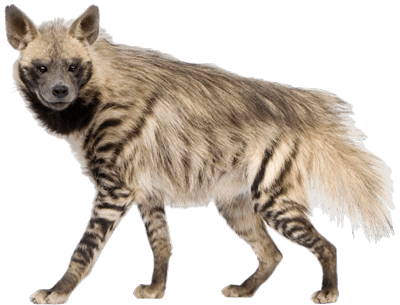 The intelligent and bold hyena will raid food stores and crops and are blamed for many livestock. Spotted hyenas live together in large groups called clans that may include up 80 individuals and are led by females. Spotted hyenas are quite vocal and make a wide variety of sounds, including "laughing"; hence the term "laughing hyena".